THE Foot-Up is a lightweight ankle orthosis, designed to provide dynamic support for drop foot or similar conditions. This simple orthosis not only provides visible improvement in the patient's gait, by providing support the moment the foot is raised, but it is easy to fit and practically invisible when worn. 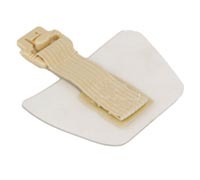 As a response to patient requests, this hugely popular product is now available in beige. 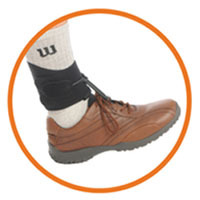 Foot-up combines two separate parts; an ergonomic ankle wrap, which connects to a plastic inlay that fits between the tongue and the laces of a shoe. A separate shoeless foot wrap is also available, which enables the orthosis to be worn without footwear. Both attachments fasten to the ankle wrap by a strong elastic strap with a quick release clip. The ankle wrap is made from a breathable three-layered structure, which makes it comfortable to wear for long periods, without causing irritation to the skin or impeding the foot's freedom of movement. The Foot-up is available in three sizes and includes a shoe inlay. Additional plastic inlays and the Shoeless Foot Wrap are supplied separately from www.ossurwebshop.co.uk. Discounts apply on orders of a Foot-Up and Shoeless Wrap together. ORTHOTIX'S comprehensive range of sports and orthopaedic bracing now includes the revolutionary Boxia ankle foot orthosis for flaccid paralysis drop foot sufferers. Manufactured using the latest generation of fabrics and elastomers it is comfortable, cosmetic and discreetly provides full functionality. The Boxia device consists of two separate components; a cuff situated above the ankle and a non-slip hook section placed between the footwear?s tongue and laces/Velcro straps. These sections are connected by an elastic strap which provides complete adjustment of the required level of dorsiflexion. The Boxia support raises the forefoot, providing vital foot clearance during swing phase, reducing the risk of tripping over everyday items such as rugs, kerbs and uneven surfaces. The Boxia also encourages natural gait pattern by allowing normal ankle movement when stepping off the foot. A shoeless attachment is also available for this product from Orthotix. Introducing Memo children's shoes, sandals, boots and inserts with the unique Memo Diagnostic System. (As displayed at BAPO). Memo shoes are a medically registered product, highly supportive and hardwearing and have been sold in Europe for over 25 years and over 7 years by Equip To Move Ltd, UK Distributor. Memo shoes are available in a wide range of trendy styles and colours and available from baby size 2 to adult size 6 and include a school shoe range. Memo shoes are very cost effective with most ranges just £65 a pair. For NHS procurement we can offer a discounted price. We carry a large stock and can dispatch the same day. We can bring a selection of our stock to you so your Orthotic team can see these lovely boots and shoes. info@cppcltd.co.uk CPPC House, 1 Kings Road, Flitwick Bedfordshire. DENOVO Healthcare is a dynamic and progressive patient centred company focused on providing some of the most innovative products and services from around the world to the UK healthcare market. As distributors for some of the best known and reputable suppliers in the world we have a lot to offer. Our successful Nimco Made4You children's footwear range has now been enhanced with the new exciting addition of the BOA® closure system. This system is an innovative method of closing your footwear, which is easier and stronger than both lace and Velcro options. With a simple one-handed turn of a dial, you can tighten your shoes up to the desired amount with a level of precision, which is not achievable with other closure options. Removing your Nimco shoes with a BOA® closure is as easy as pulling the adjustment wheel outwards, which instantly releases the steel lace mechanism. The BOA® closure is available on the front of the shoe for a standard opening or with a rear closure option which releases and opens up the back of the shoe to provide a very easy way of putting on shoes over AFOs. Being able to operate the BOA® one handed, coupled with the easy to use mechanism not only enables independent footwear use, but encourages it by boosting wearer confidence when the shoes are fastened correctly first time, every time. THE front opening design and easy-opening tabs on the Velcro straps make this brace suitable for the arthritic or elderly patients, who may suffer from limited dexterity. The brace incorporates hyper stop hinges which provide medial and lateral support for unstable knee, while allowing flexion. The internal access to the hinge allows for easy removal for laundering. Contrasting proximal and distal strap to counter rotation. Open popliteal area for added comfort during flexion. Easy grip stabs for patients with porr dexterity. Fully adjustable front and rear straps. Mild to moderate valgus / varus deformity. NEW from Beagle Orthopaedic's Custom Fabrication Department is their Torticollis Orthosis, designed to offer patients with this distressing condition a long-term comfortable solution to integrate into their daily lives. 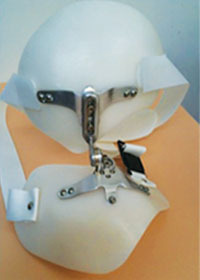 Constructed from thermoformable plastics, which vary dependent upon their required function, the shoulder and head components are linked using an innovative hinge which uses multi-directional adjustment in the flexion/extension plane, rotational adjustment to ensure optimal stabilisation when correction is applied to the joint, and also allows the head component to be raised. The orthosis is secured with a circumferential strap with ultra low profile buckle, and further optional fastenings to control the head movement can be supplied as required.